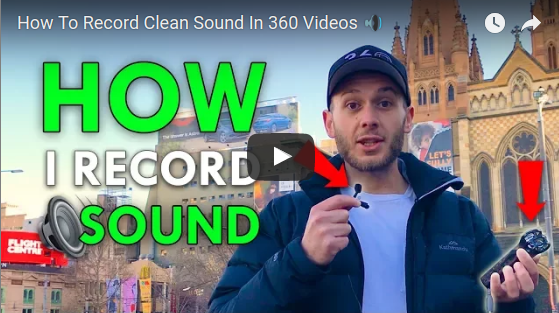 Ben Claremont (Life in 360) posted a very useful tip about improving sound in 360 videos. Improving audio an effective and important way for improving your 360 video quality, yet often overlooked by many of us who are visually oriented. I myself made that mistake in my older videos where I didn’t bother to fix bad audio, thinking viewers would look past it and pay attention to the substance. Sorry to say, they didn’t. So, ignore audio at your risk! Some comments about the video: Ben recommended the Rode lavalier mic, which he actually recommended to me as well when I had audio problems in my videos. I thought the price was kind of high (because I wasn’t accustomed to getting decent audio recording equipment). But I got it anyway and no one’s been complaining about the audio for videos where I used the Rode mic, so I suppose it did its job. BTW, I should add that there are a few 360 cameras that do have a microphone jack: the Kodak PIXPRO Orbit360, the upcoming Ricoh Theta V (Theta 4K), the old Insta360 4K Beta, and the Insta360 Pro (in fact, the Insta360 Pro can also record from a USB microphone) are some of them. In addition, the Insta360 Nano, Insta360 Air, and Ion360 U are some 360 smartphone cameras that can also use an external microphone via the smartphone’s earphone / microphone jack. How about you? Do you already use an external recorder when using your 360 camera? What do you think about using a recorder versus a smartphone? Let me know in the comments! Thank you very much to Upton North for bringing Ben’s video to my attention! How to sychron the Audio with a Xiaomi Mijia Mi? For post production i started to use 2 programs now. Both are free. I use for the cut shotcut because there i have unlimited video (hmmm english…) tracks is the right word, isn’t it? and audio tracks… And for Audio the best is for me the free program Audacity what is open source also. that way i can use a cheap König mic for 2 $ and result is close to the rhode you suggest. As well same as you do for cuting you need to take some time to learn first and understand and build yours workflow. but if you have it once yours workflow it is perfect. No 4 K Videos for the moment with the 360 in my chanel because i just have a Samsung S2 Galaxy and the Mi workflow i need to look how to do it inside Linux. But both programs are available for other OS but my things i do mainly with linux. For Windows i have just a little old Laptop. But i think for Audio and Video this both programms are usefull if you like to use legal yours software and do not like to use cracked Adobe programs for thousands of $. If you go high level also free Gimp and Blender do same for you for free.